The other day Sean came home from work with Breath Right strips. I’m one of those pregnant ladies that starts to really snore in the third trimester. Sean’s been managing it this time with ear plugs, but the other night he heard me wake myself up 3 or 4 times before he put his plugs in. “I think one of the reasons you’re so tired is because your snoring is even waking you up,” he said. So he bought me the stripes so I could hopefully sleep better. And it’s working! I wake up more refreshed! 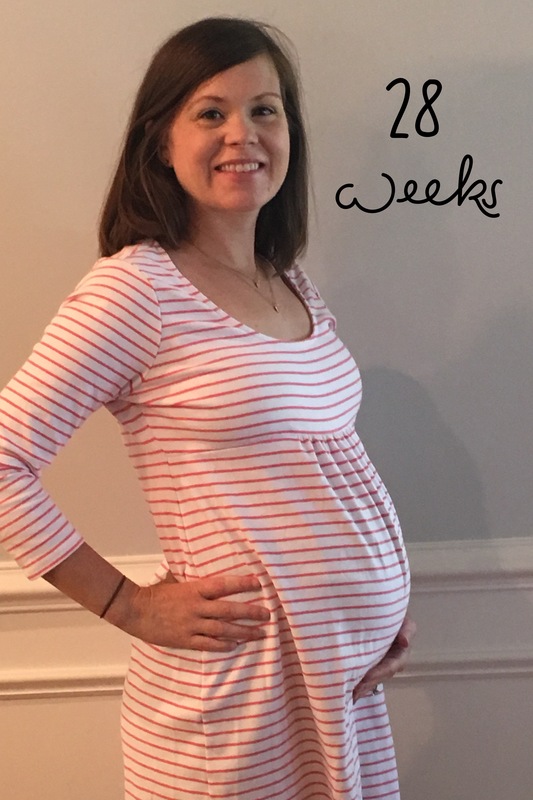 I’m still tired because I’m pregnant, but definitely more refreshed! Yay for Sean! Yay for Breath Right strips. Too bad we didn’t think about this months ago! I was getting ready a few days after Sean made this purchase and Wes found the strips. He asked if I could help him open one, so I did. I went back to getting ready and then he comes over with the strip on his own little nose! Sean and I love this picture, so I had to share. I wish I had taken a picture or walked you through what we took to the hospital when I was pregnant with Wes. I don’t remember everything, but I know it was ridiculous. We had three whole bags that poor Sean had to lug around, and we barely touched anything. I think he also had to shove his stuff into a corner of a bag so we didn’t end up with four. They were fairly big bags too. We didn’t touch the diapers or wipes or pads or snacks or so many of the other things the internet told me I’d want but the hospital provides. This time, I’m bringing two much smaller bags. I do have a set of clothes in my bag that I might toss out depending on when we leave and what I’m already wearing when we leave. Even with that extra set of clothes Sean can easily put his stuff in my bag. I like that for this aspect of our hospital visit with BA2 I can say been here done that and we don’t need nearly four bags of things. The rest of this hospital visit I’m sure will be very different than our first. 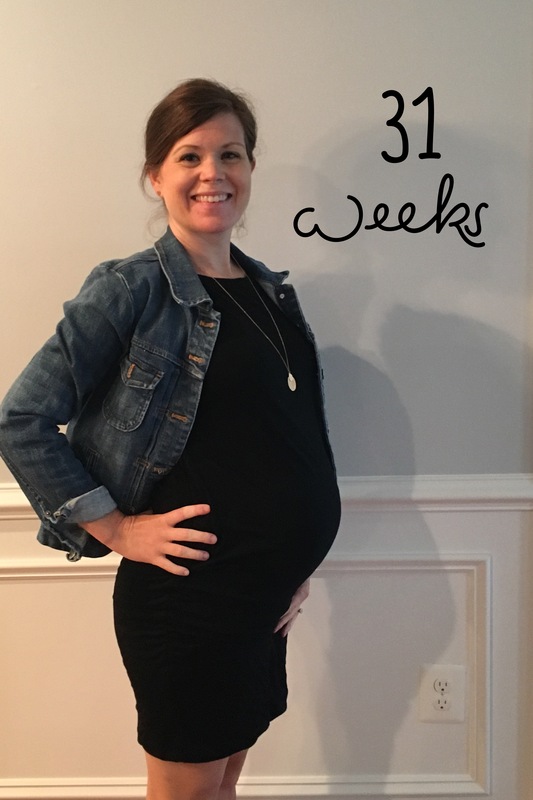 I was swapping birth stories with friends recently and it’s amazing how different birth stories are. I wonder how BA2 will come…. 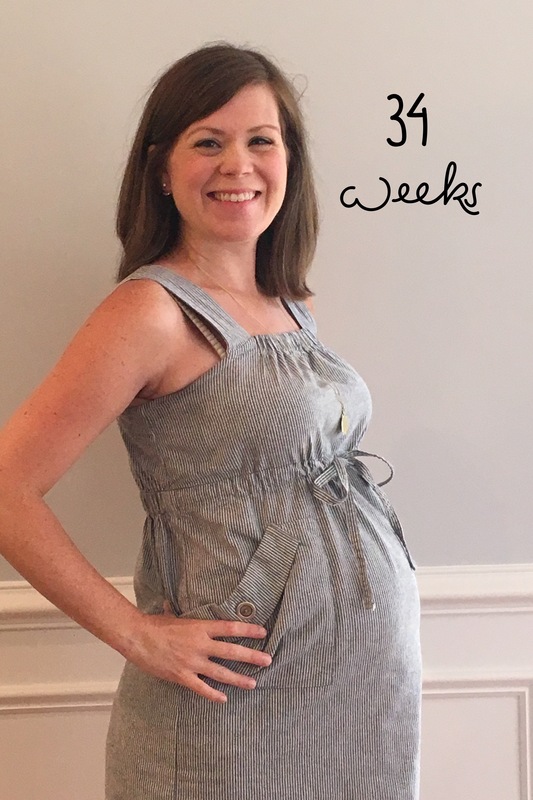 It’s so interesting how 6 more weeks can seem like the shortest amount of time and the longest amount of time simultaneously. 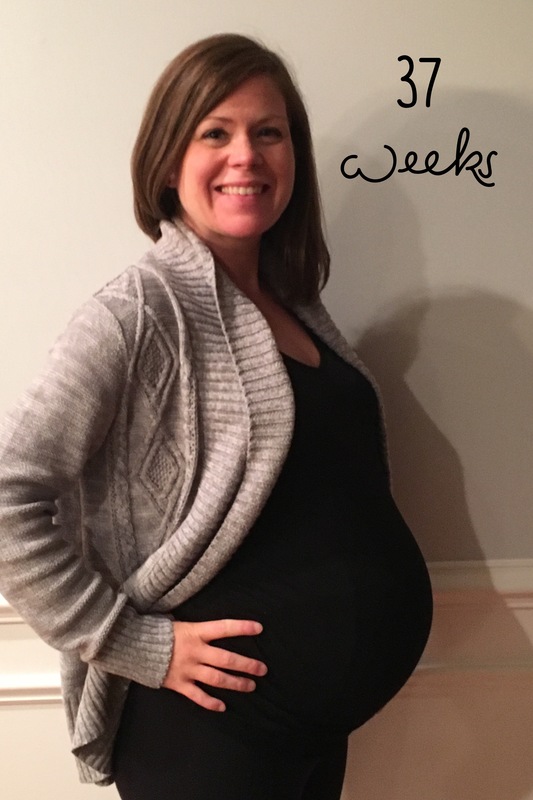 As my last trimester started I felt totally unprepared for the end of this pregnancy. But things are falling into place now. We have a plan for what to do with Wes should BA2 come suddenly, her clothes are folded and in a dresser, the books are in the book shelf, all of the essentials for at least the first few days are here at our house. There are still some things to do, but we’re in a good place now. Which is great so I have more time for naps. 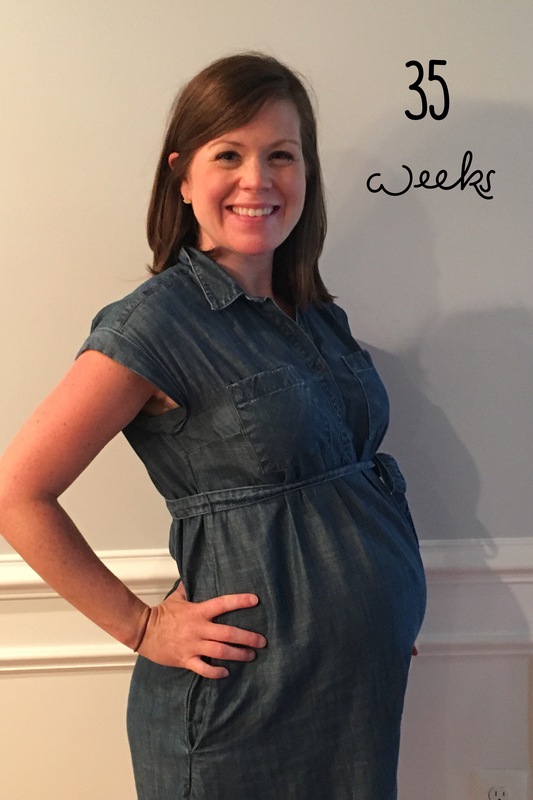 As this pregnancy comes to a close I’m reminded that these are my last few weeks of just Wes and me. He’s getting a little clingy, which I think is normal based on discussions I’ve had with some of my friends. It’s really sweet. I get a lot of hugs and kisses and requests to build and play. Even when Sean is home. That’s a big deal. It makes me a little sad. Sad that I won’t be able to give him this much attention ever again, and we won’t be just Wes and me in the same away ever again. But I know that will also be a good thing. I got over some heartburn this week. It was an easy fix and I should have Googled it sooner. Sean had to do it for me. Turns out laying down after dinner is not great when you’re pregnant. There’s not much room to digest and laying down makes it worse creating heartburn. Maybe I’m not remembering correctly, but I didn’t have any heartburn with Wes and I definitely used to lie down after dinner. I’d also been drinking a nightly glass of lemonade as my “cocktail,” and think that had something to do with it. I was pretty sad to give up the lemonade at first, but the trade off is so much better. We went to IKEA this past weekend for a dresser and bookshelf for BA2. Sean put it all together and Wes sorta kinda helped me fold clothes and place books on the shelf. 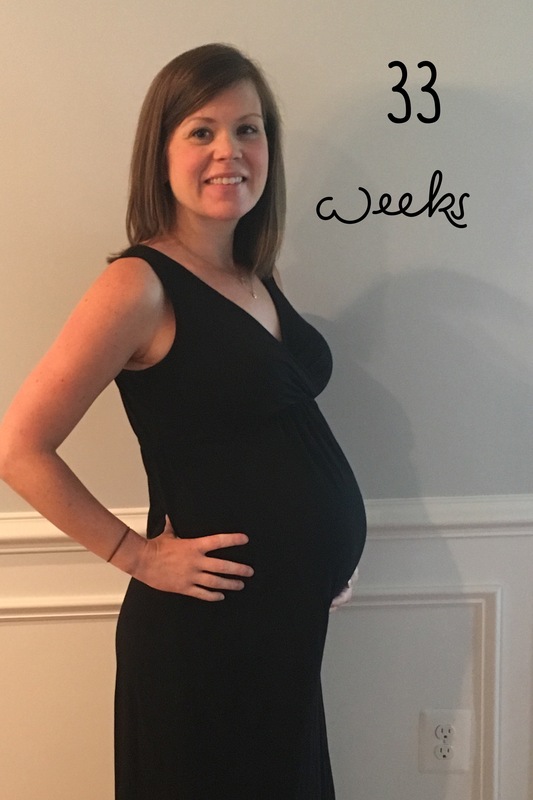 Last week I was feeling far from ready for this baby to come, but this week I’m feeling much better. 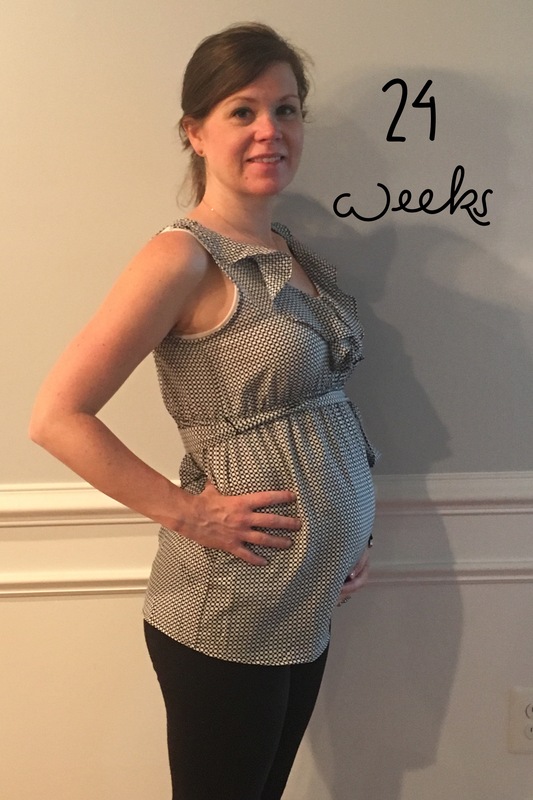 I don’t have a good excuse for week 29, but I didn’t take a picture. I did take a picture last week but haven’t written because I’m distracted. We started to potty train last week. Potty training is so emotional! I’ve laughed, I’ve cried, I’ve felt encouraged and completely discouraged. It takes up a lot of head space. I’m very tired. I’ve decided to think of it as good practice for the newborn days we’re about to head into very soon. I’m hyper aware of Wes’s input and output in a way I haven’t been in a long, long time. And we’re about 8 weeks away from that with BA2. Isn’t that unbelievable that we’re in the single digits?! 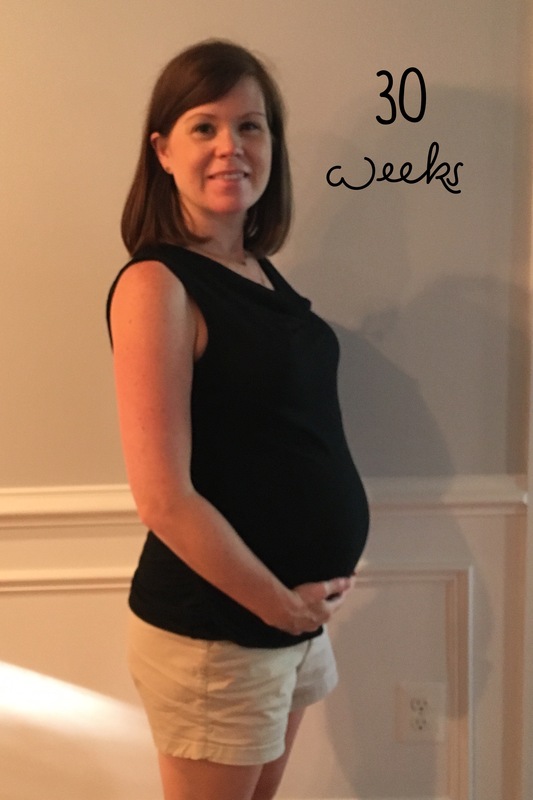 I had a Braxton Hicks contraction over the weekend during yoga. At least I think that’s what it was. I didn’t feel any of these with Wes so I don’t have a lot of experience here. 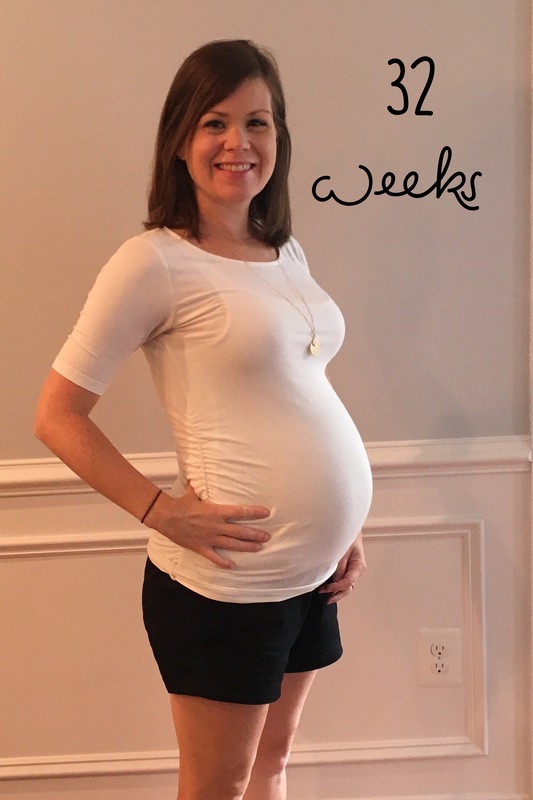 I spent some time researching Braxton Hicks and freaking out that it was a sign that BA2 would arrive at 35 weeks instead of on time or later (it’s not, in case you’re unfamiliar. 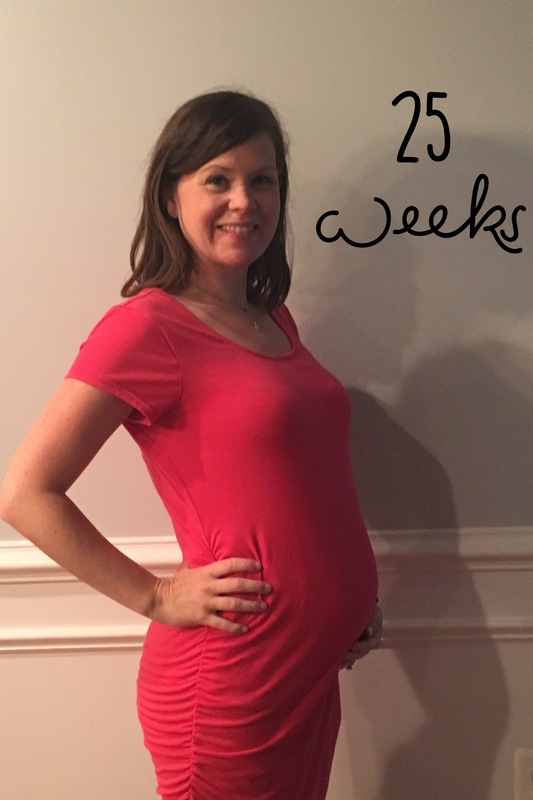 Just a totally normal thing that happens in pregnancy). 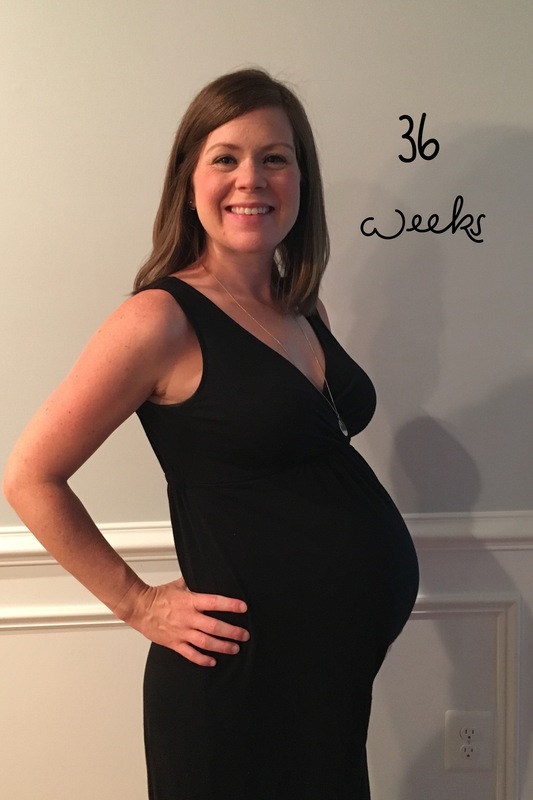 Sean asked why I chose to focus on 35 weeks. Because it’s 2 away from full term and I wouldn’t have had an opportunity to make freezer meals. He joked with me and helped calm some of my anxieties. That even if she does come at 35 weeks and the freezer isn’t stocked, we’ll be fine. I’m still anxious about so much, because of course, but thank goodness for the balance Sean provides. I know I skipped week 27. I forgot to take a picture. Week 27 and week 28 were so similar anyway. 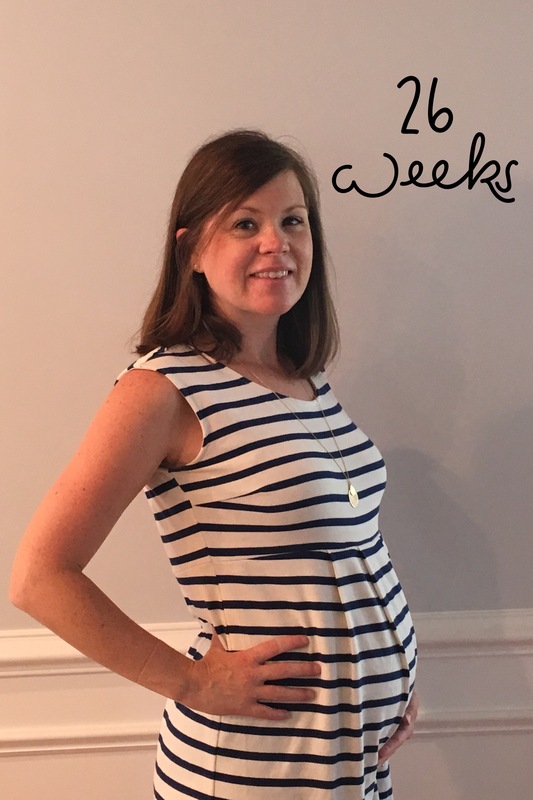 I’m in the 3rd trimester as of this week! I can’t believe it! This has all gone by so fast! I’ve had a good month of time. There have been little things here and there, like some carpal tunnel and the need to waddle by the end of the day, but overall the last month has been one of the best. Despite being so hot! I have this recollection that the summer before Wes was born wasn’t so bad. I remember being mostly comfortable (temperature-wise) the whole summer. I forgot that I spent my days in cushy air conditioning. What a different world with a small child that likes to be outside. It’s amazing how hot I can get by just sitting in the sun. And, yeah, how often am I just sitting? It’s worth it though. I’ve really come to love being outside, even if I wish it were a little cooler sometimes. More importantly, it makes Wes so happy! People ask me often if I think Wes understands he’s going to be a big brother. As much as a 2.5 year old can, I say. It is sweet the way he knows her name and sometimes kisses my belly with the intention of giving her a kiss. He sometimes includes her in his prayers at night and, when asked, says yes of course he’ll be a big helper when she comes. We’ll see about that last one. Wes really likes babies generally and it’s so sweet, but I have no doubt that our transition will be incredibly hard. In other news this week, BA2 is starting to do that thing where she presses on me with a body part. Like she’s just trying to make sure the boundaries are real and she really can’t get out yet. Her schedule has changed. She used to move a lot in the evening but she’s more active in the morning and afternoon now. All this movement makes it more fun. For the first time, Wes came to one of my regular doctor appointments. 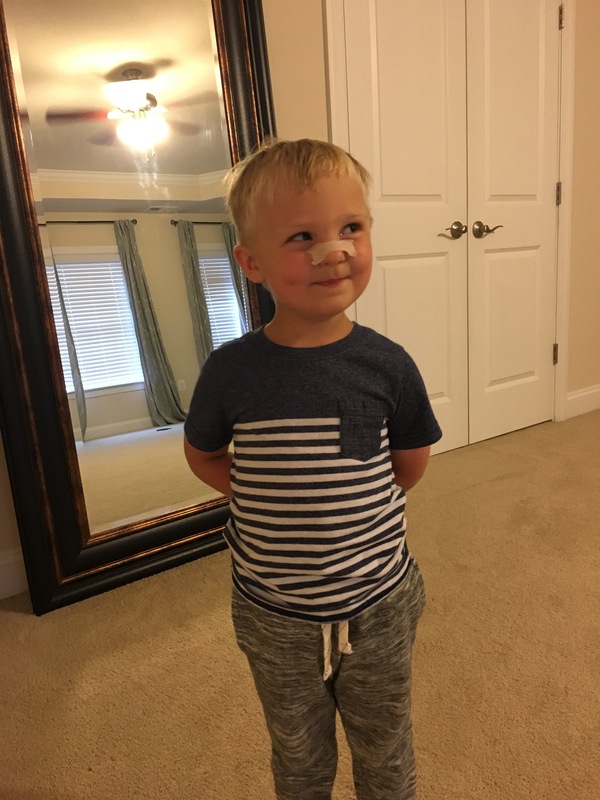 He came to the anatomy scan so he kept asking about whether we’d get to see her on the TV screen and if Daddy would be there. He was fascinated by the doctor and BA2’s heartbeat. And luckily everyone gave him lots of stickers and smiles. In the elevator after our appointment there was a woman who tried to engage Wes and then said to me how much she missed the days I am in right now. I told her that I’ve been told that before and appreciate the reminder. I really do. That some days can be really hard but I also try really hard to keep this in mind. Because I do have a sense that I will miss this sweet time. This time of random kisses and hugs and “I love yous.” This time of rediscovering very ordinary things through the eyes of a small child. This time of laughter and joy. 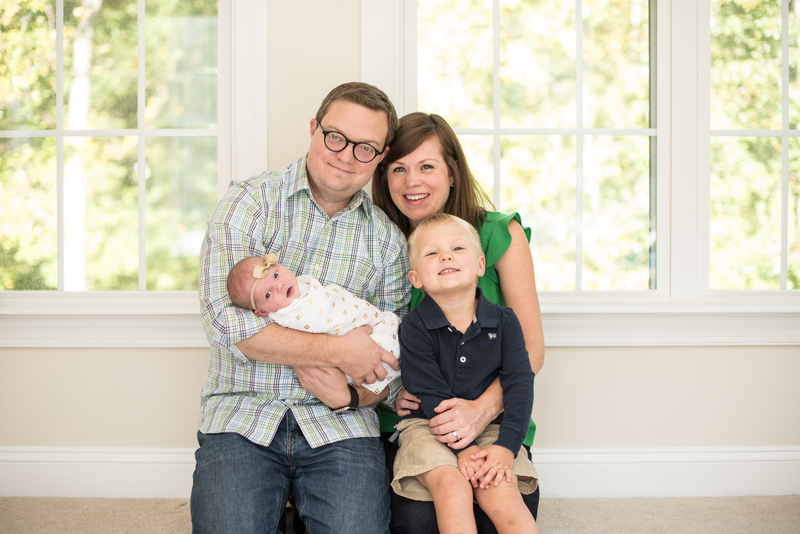 But when you’re in the trenches of parenthood it can be so, so hard to remember that these days are some of the best. I don’t believe the bad outweighs the good, but the bad days can be pretty discouraging. But I try to remember that I will miss these days just like all of the ladies in the elevators (and there are so, so many ladies in elevators missing these days it seems) remind me. Even as I fret about how I’ll work another baby into all of this. I’ll try to remember and enjoy. Sean and I were away this past weekend. More on that later, but Wes didn’t come with us so I was reminded what it was like to be pregnant without a toddler. I rubbed my belly a lot more than I do normally and spent way more time daydreaming about BA2 then I think I have my entire pregnancy. It was nice. Before our trip I’d started to feel very uncomfortable by the end of the day. Barely wanted to eat dinner and couldn’t get comfortable on the couch at all. I’ve stopped running because of my heart palpitations. I moved a lot during our weekend away without any heart palpitations and felt so much better! So for week 25 I’m going to try to start running again since I know what a difference it makes and now that my heart palpitations seem to be under control.